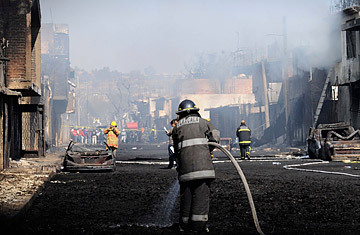 Firemen extinguish a fire on the streets of San Martin Texmelucan, Puebla, after a deadly explosion of a PEMEX oil pipeline, on December 19, 2010. In the early hours of a frosty February morning, a resident in the Central Mexican town of Amozoc heard suspicious noises in the field near his house. He called for help. When the state agents arrived, they found a truck trying to leave the area  with a whopping 5,000 gallons of crude oil in the back. The three men on board had drilled a hole into a major oil pipeline that runs through the town and sucked the fuel into their truck through a hose. Worst of all, the alleged culprits were town policemen. Such oil theft has become increasingly common in Mexico amid a breakdown in law-and-order in certain states. Last year, the government oil monopoly Petroleos Mexicanos or Pemex detected 712 such pipeline taps  a fivefold increase compared to the 136 spotted in 2005. It represents a significant loss of government income at a time when revolution in the Middle East has pushed crude oil prices to nearly $100 a barrel. (The Amozoc haul would be the equivalent of about 120 barrels or roughly $12,000.) Adding to the alarm, detectives working on several cases have traced the thefts to drug cartels, such as the Zetas, an indication that the country's overlords of crime have branched out into yet another line of business. Oil thieves sometimes hawk stolen gasoline on the side of highways. But other times it is actually sold by middlemen to Pemex franchise gas stations  and ends up in the cars of unknowing consumers. Meanwhile, stolen crude is sold off to brick makers who use the fuel to fire their ovens; or it is smuggled across the border and peddled to oil tycoons in the United States. Following a bi-national probe, U.S. police charged five Houston-based oil brokers with receiving stolen Mexican fuel (in this case, petroleum condesate), including the president of Continental Fuels who was given probation by a Houston federal court in January. Pemex officials argue they are getting better at detecting the illegal taps, but concede it is a tough to stop the robbers. "We have the technology to detect any change of pressure in the pipelines. But as you see, they are very sophisticated gangs who know our operations," Pemex Director Juan Jose Suarez told a recent news conference. The problem is aggravated by the fact that some of the Mexican states with the most oil are the scenes of its worst drug violence, such as Tamaulipas on the border with Texas. Among recent bloodshed there: the assassination of the leading gubernatorial candidate last June; the slaughter of an entire village that had been fleeing gangsters in December; and the killing of 18 people in a single gunfight on March 7. Stolen oil ends up low on the list of crimes for police to deal with. The crime has other hazards. Pemex officials say attempted theft may have caused an oil leak that triggered an explosion in the town of San Martin Texmelucan in December. The blast sent flames  as high as 30 yards and at temperatures of as much as 1,000 degrees centigrade  down the streets, incinerating dozens of homes and killing 30 people. Resident Oscar Quiroz woke up that morning to the roar of flames and screams. After rescuing his family, he pulled neighbors from burning houses. "This was where my neighbor and her two children lived," Quiroz says, pointing to a charred patch of ground. "All that was left of them was ashes. This is something that nobody should have to go through."